Sometime in the future, or in a parallel time, scientists have replicated the world in the virtual reality of cyber-space to study the destiny of mankind. The Project, as it is called, has populated this virtual world with virtual human beings (v-people) who experience 'life' in a simulation of that experienced in the real world by real people. The virtual world seems to run independently of the scientists who created it. Nevertheless influences from the real world impact the lives of the v-people and their future destiny depends on whose inspirations they will choose to follow. 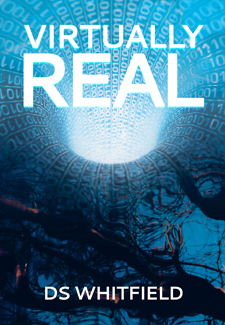 Virtually Real is a 'thought experiment' that deals with the interactions and influences that affect all people whether for 'good' or 'evil', in both the real and virtual worlds. Within the fiction, there are concepts of truth and arrows of direction for our lives and the world we live in. Help: Click 'Add to Cart' to purchase the printed book version. You can continuing browsing other Castle titles after adding this book to your cart. To view your cart click 'View Cart' in the top menu. Powered by PayPal (PayPal account not required for purchases). To purchase the eBook version, click on the Kindle icon to buy from our eBook retail partners.